Some thoughts on thirty years of life with Mozart's opera. Cherubino in the chair, discovered by the Count. The Marriage of Figaro and I have been through a lot together. 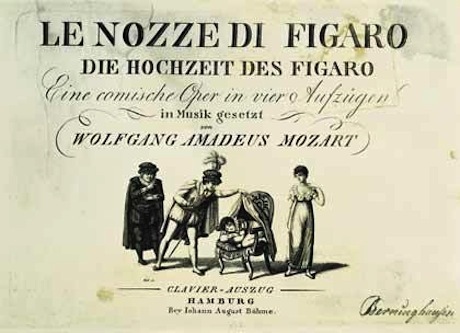 I first saw Mozart's opera at the New York City Opera with my parents and while my young self may have snoozed through some of its four hour length (I think I was ten years old at the time) what I remembered of the show was engrossing, the madcap household and its goings-on, with the supremely confident and nimble Figaro at its center had immediate appeal. Three very different casts and three runs for Puccini's final opera. 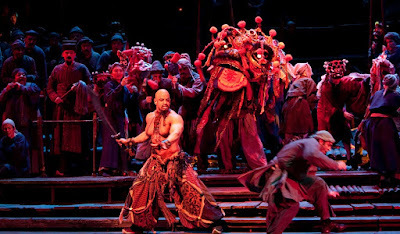 of the Metropolitan Opera's production of Puccini's Turandot. This umpteenth revival of the Metropolitan Opera's everything-into-the-wok Franco Zeffirelli production of Puccini's Turandot appears in three separate runs this season. Christine Goerke, Lise Lindstrom, Jennifer Wilson and Nina Stemme are the four formidable sopranos who will sing the hellishly difficult title role. This is one of the last surviving Zeff productions in the Met repertory along with La bohéme, and is a feast for the eyes as well as the ears. 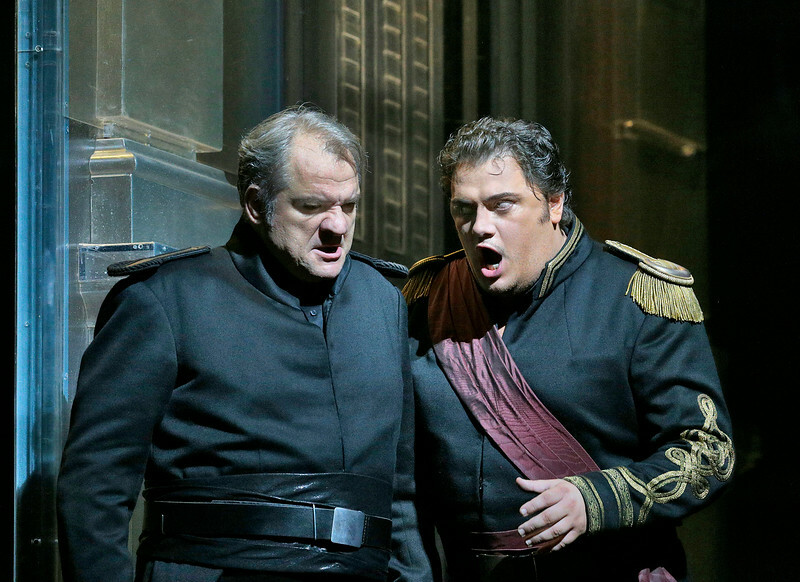 The Met opens with Bartlett Sher's new Otello. why Verdi considered naming this opera Jago. The Metropolitan Opera's new production of Verdi's Otello, which opened the company's 2015 season last night in a special gala performance, contains a preponderance of good directorial ideas, supporting a strong cast in this adaptation of Shakespeare's drama. This performance was broadcast live in Times Square on that crossing's giant television screens, and lost none of its power to shock and entertain despite having to compete with tourists, fire trucks, chattering desnudas and a street performer in an Elmo costume who stopped bothering said tourists long enough to watch the drama unfold. The New York Philharmonic plays On The Waterfront. 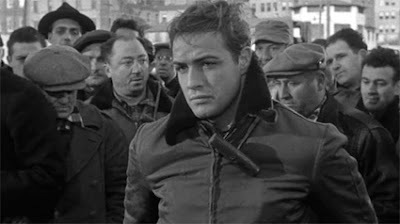 Give him the hook: Marlon Brando in On the Waterfront. Photo © 1954 Columbia Pictures. In the history of the New York Philharmonic, no conductor is more revered or loved than Leonard Bernstein, the Massachusetts-born composer who held the post of music director from 1958-1969. On Friday night at the soon-to-be-renamed Avery Fisher Hall, the Philharmonic kicked off this year's series celebrating film music with Bernstein's lone film score: On The Waterfront. Arvo Pärt's 80th Birthday: Sept. 11, 2015. The Temple of Dendur in the Sackler Wing of the Metropolitan Museum of Art. Photo © 2015 The Metropolitan Museum of Art. When you live in New York City, (and when you're from here like I am) September 11th is an inevitability. The permanently altered skyline, the terror brought by a bright, blue sky in late summer, the yearly beams of light shot above the city, the reading of the names of the victims of the terrorist attack: all can be overwhelming for those of us who've lived here all our lives and who survived the events of that lonesome day. The 1963 Herbert von Karajan Tannhäuser on DG. Hans Beirer as Tannhäuser, Vienna, 1963. Photo © 1998 Deutsche Grammophon/UMG/Archives of the Vienna State Opera. In his five decades on the podium, the late Austrian conductor Herbert von Karajan committed nine of the ten "canon" Wagner operas to disc. He made studio recordings with Berlin, Vienna and Dresden, releasing these performances for EMI Classics (Tristan, Lohengrin, Dutchman, Meistersinger) and Deutsche Grammophon (Parsifal and the Ring.) 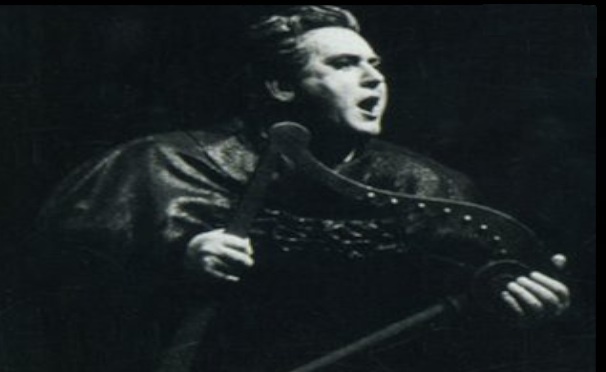 The missing opera was Tannh äuser, a work which eludes any sort of definitive set-in-stone interpretation. In 1998, this recording was finally released on DG. If you can find an import copy of this recording, you can finally hear Karajan's take on Wagner's most problematic mature work. Gerald Finley is Don Giovanni from Glyndebourne. 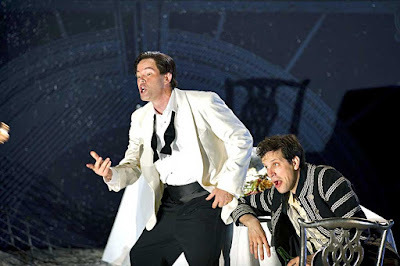 Gerald Finley and Luca Pisaroni in Don Giovanni. Photo by Bill Cooper © 2011 EMI Classics/Glyndebourne Festival. Mozart's Don Giovanni has long been burdened with the title of the "greatest" of all operas. 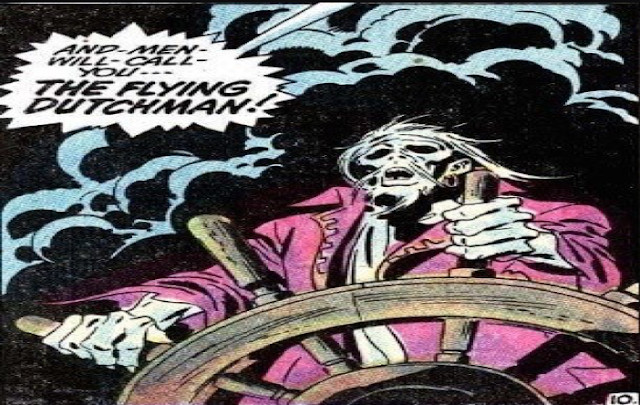 And yet, it remains an elusive subject for directors who seek to bring something new to the tale of a rakish nobleman and a dinner date gone horribly wrong. This performance from the Glyndebourne Festival (originally released by EMI, broadcast by Medici.TV and viewed on Amazon Prime Video on Demand) preserves the production by the team of director Jonathan Kent and Paul Brown that graced the Glyndebourne Festival in 2010. Two Bayreuth Lohengrins offer very different takes on Wagner's mythic opera. 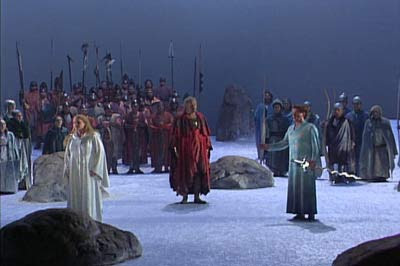 Cheryl Studer, Manfred Schenk and Paul Frey in Lohengrin. Back in the misty era known as the 1990s, a humble young journalism student would go to the Tower Records in Boston and rent VHS opera performances, mostly released on the Philips label. Among those videos: two vastly different stagings of the Wagner opera Lohengrin from the Bayreuth Festspielhaus, filmed eight years apart. Universal Classics has acquired the rights to the Philips catalogue, and has re-released both performances on DVD under the DG imprint. Claudio Abbado's classic Un Ballo in Maschera. 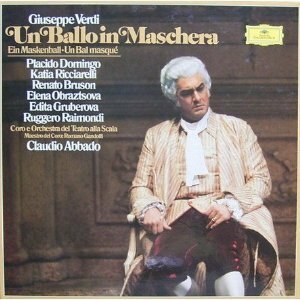 The third in this survey of the La Scala Verdi recordings (and yes, it's wilfully out of order) is this excellent and mostly forgotten Un Ballo in Maschera, conducted with flair by the late Claudio Abbado. Like Abbado's Aida (which was made around the same time with a lot of the same players) this Ballo was made at the very end of the analogue recording era, made in 1981 on the eve of the launch of the compact disc. And the warm, glowing sound of the violins and voices makes one regret all the problems that hit the recording industry because of that transition.